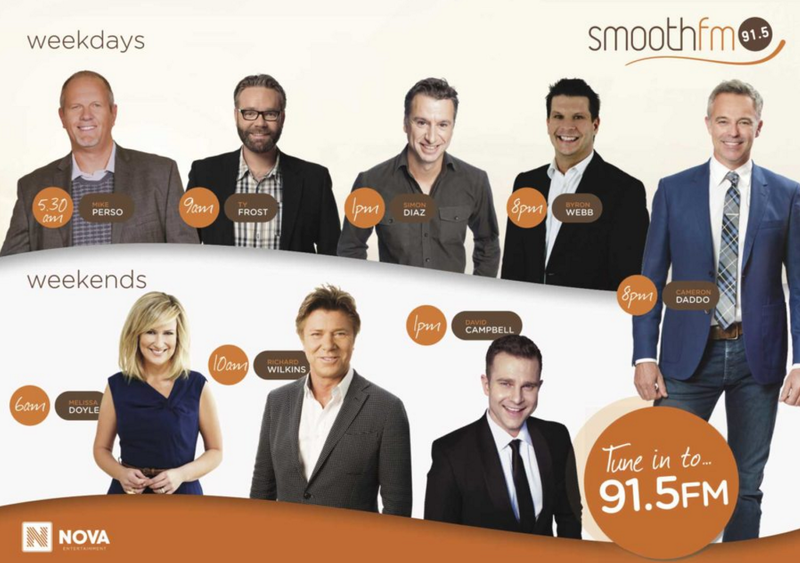 Nova’s Smooth FM has overtaken Southern Cross Austereo’s Fox FM as the most-listened-to commercial radio station overall as it climbed 0.1 share points to 9.5% in survey five. Fox FM fell 1.1 points from 9.9% in the last survey, to an overall audience share of 8.8%, dropping to third place. Gold 104.3 also managed to beat the former first place holder with a 9.1% share. Nova 100.3 FM saw a slight increase of 0.1 points holding its fourth place position with a share of 8% and a clear lead on Triple M’s stagnant 6.6% share. The FM station with the lowest-scoring commercial radio share was Kiis FM as it dropped 0.3 points from 6.4% to 6.1%. Winning in overall audience share across the two spectrums (AM and FM) was 3AW with a 14.8% share as it improved from last survey’s 14.4%. ABC Melbourne also managed a high audience share with 9.9% as it jumped from its previous 9.2%. In the drive battle Fox FM took another hit as 3AW managed to regain its title of the most-popular drive program overall. Last survey 3AW’s Tom Elliott fell 0.5 points to 12.8%, however, he managed to regain 0.1 points to a 12.4% share in survey five. Fox FM’s Hamish and Andy dropped 2.6 points to a 10.3% share from survey four’s 12.9%. During this survey Hamish Blake took paternity leave with the duo off air for four weeks. Nova’s Kate Ritchie, Tim Blackwell and Marty Sheargold are hot on Hamish & Andy’s heels jumping 0.4 points to a 10.1% share. Coming in third place was Smooth FM’s Byron Webb as he managed an 8.9% share, improving 0.8 points. Fourth place went to Gold 104.3 with 7.8% followed by Kiis FM’s Dave Hughes and Kate Langbroek 6.8% share as they lost 0.7 points. Despite improving 0.6 points, the drive program with the lowest commercial audience share was Triple M with 6.6%. Although winning the breakfast ratings battle, Fox FM lost another 0.9 points as Fifi Box, Dave Thornton, Brendan Fevola and Byron Cooke managed a 7.9% share compared to last survey’s 8.8% share. Nova 100.3 again trailed very closely behind Fox FM with Chrissie Swan, Sam Pang and Jonathan Brown managing to grow 0.5 points from 7.3% to 7.8%. Coming in third was Gold 104.3 with a 7.6% share as Smooth FM maintained its fourth place with a 7.5% share. Kiis FM maintained its spot on the bottom of the FM ratings ladder despite Matt Tilley and Meshel Laurie improving 0.2 points to a 6.4% share. Again 3AW well and truly beat the commercial FM radio stations in overall audience share with a whopping 20.5% share, jumping from its previous 19.8% share. ABC Melbourne also managed to improve 0.9 points to 9.9% well ahead of the rest of the AM stations. Why does Mumbrella always headline Radio Ratings with “XYZ”-FM Station wins? In most (all) cities an AM Station or two are leaders. In Melbourne in this period the leading FM Station only attracts about two thirds of the audience of the Winner, which happens to be an AM Station. Surely all Stations should be considered for your headline and then if you want to segment it up do that in the article following. Thanks for the question. This does come up from time to time. If we were to be writing a feature, or general overview of who has the biggest share in a given market, it might well lead off on the talkback players in Sydney and Melbourne, because that’s them and has been for a very long time. With a news story, we focus on what’s new, changing or has changed. With eight ratings announcements a year, it would become somewhat repetitive to continually angle it on the status quo, that the talkback station is still on top. Smooth’s popularity proves radio is background music. Why doesn’t Classic Rock 1377am get mentioned?? Bring back music(as it usetobee) to1278 Magic asap ratings for lifestyle replacement Shocking ! We get enough talk on3AW as it is. I agree. Please bring back magic. Magic 1278 was rating at least in the the twos prior to “Lifestyle” now the ratings are a miserable 0.4, bring back the old Magic with the great easy listening music. Smooth FM has proven that the easy music format is at least popular. I have once tuned to 3aw radio accidentally 2years ago, and never looked back again. Love you 3aw keep it up.